Our recipe swap them this time around was your favorite celebrity recipe. When I received Alton Brown’s Mac & Cheese from Does Not Cook Well With Others, I knew right away I’d be making a few adaptations. After all, I already have a great go-to recipe for baked mac & cheese. The night before I made this dish, Frank, Bella and I went to a new local burger place for dinner. We ordered the “crispy onions” as a side dish, since Bella and I love onion rings. Little did we know we’d be faced with a ginormous plate of pieces of fried onions. Very good but WAY too much to eat. The light bulb over my head lit up and I had those suckers packed up to go. So, as you can guess, I made some adaptations to Alton’s original recipe. And great changes they were! Yum. Preheat oven to 350 degrees. Cook elbows until al dente and drain. Melt butter in a pot over low heat, then add flour and mustard. Stir constantly until smooth, about 3 minutes. Stir in milk, bay leaf and paprika. Simmer for 10 minutes, then remove the bay leaf. Add a ladle of the milk mixture to the egg and mix, then pour into the pot with the rest of the mixture. Stir in most of both cheeses, reserving about 3/4 cup for the top. Season with salt and pepper. Gently stir in macaroni, then pour into casserole dish. Top with remaining cheese. Bake for about 25 minutes. Let sit for about 5 minutes. Top with onions and serve. This entry was posted in cheddar, cheese, leftovers, main dishes, pasta, side dishes. Bookmark the permalink. 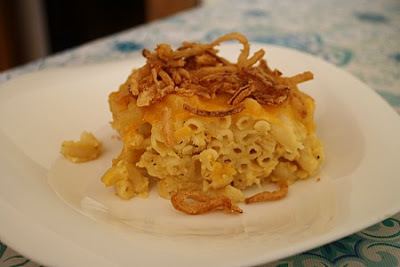 Great idea to top the mac and cheese with the onion rings! This sounds so delicious! 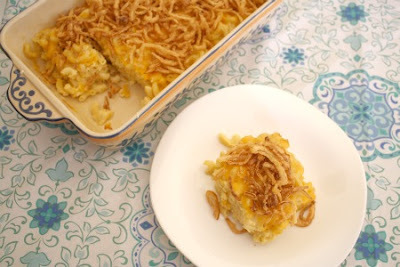 Any variation of mac and cheese is a winner in my book! Crispy onions are a GENIUS mac and cheese topping! I’m majorly enamored with this.